Most Missouri kids DO NOT drink? In fact, 85.61% of you have not drank in the past 30 days! 53.7% of you would definitely not drink alcohol if one of your best friends offered it. 68.2% think it is wrong or very wrong to drink alcohol. The average age that a person first tries alcohol in Missouri is 13.43 or 7th grade. Of the youth that reported drinking in the past 30 days, 22.8% of them reported at least one episode of binge drinking. Look at how much has changed since the first annual Speak Hard (2004) and now! Advocacy can seem like such an overwhelming word. Our goal is to break it down into smaller pieces and give you ideas of what you can do to advocate. Come join us as we share proven prevention methods that can lead to positive changes in your community. We received the Community Health in Action Award and Coalition of the Year Award in 2015 for our Nicotine is Nicotine Campaign. We were also recognized for our involvement in raising the age of tobacco and nicotine product purchase/sales from 18 to 21 in Kansas City, Missouri in 2015 and Gladstone in 2016. We will discuss how education, social marketing campaigns, and advocating to key community members (including elected officials) can result in powerful prevention. Jordan Elder and Conor Henry are the co-chairs of Youth With Vision. Youth With Vision is a student led organization made up of middle and high school students from Clay, Platte and Ray counties. Members strive to decrease substance use among their peers by putting education into action. These young leaders have gained local, statewide, and national recognition for their programs, and would love to share the knowledge gained from their efforts and campaigns with other youth groups across the state! Members of Missouri’s prevention community attended CADCA’s National Leadership Forum in February. One of the most exciting parts of this conference is the ability to head to the Hill and speak with Missouri’s legislators about important prevention issues. 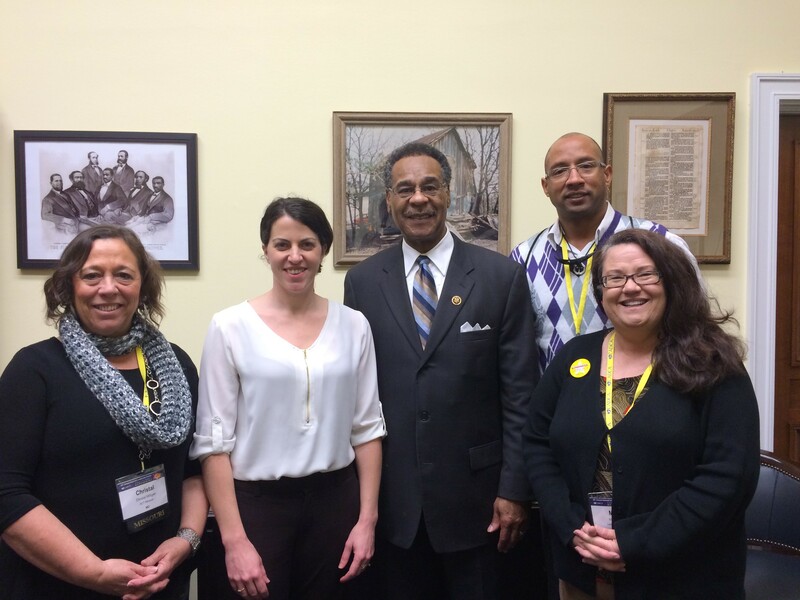 Members of Lee’s Summit CARES and First Call met with Congressman Emanuel Cleaver. 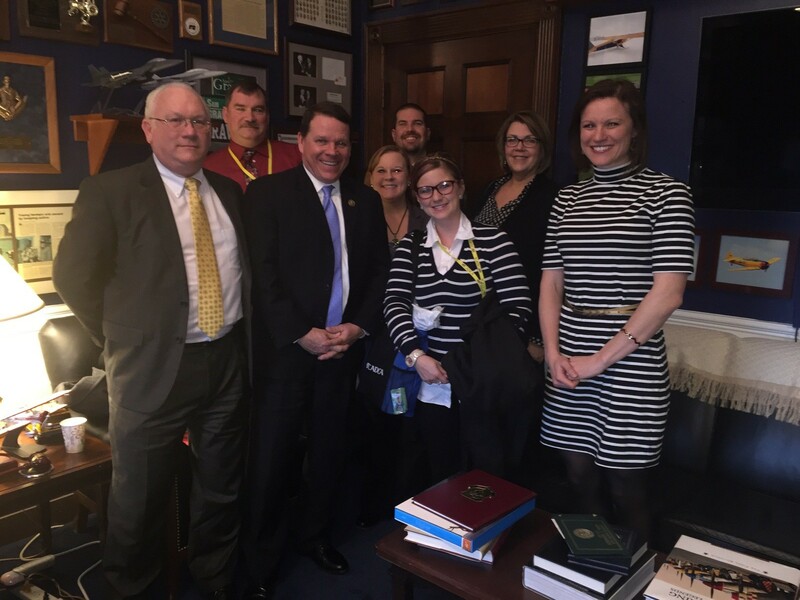 Members of St. Joseph Youth Alliance, Tri-County, Liberty Alliance for Youth, Ray County Coalition, and ACT Missouri met with Congressman Sam Graves. 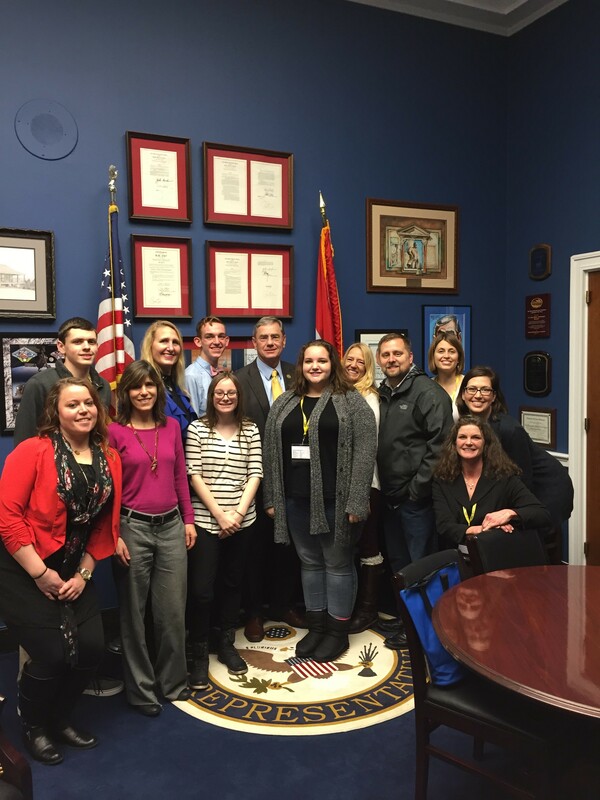 Members of Council for Drug Free Youth, Jefferson County P.R.I.D.E., Compass Prevention, and ACT Missouri met with Congressman Blaine Luetkemeyer. 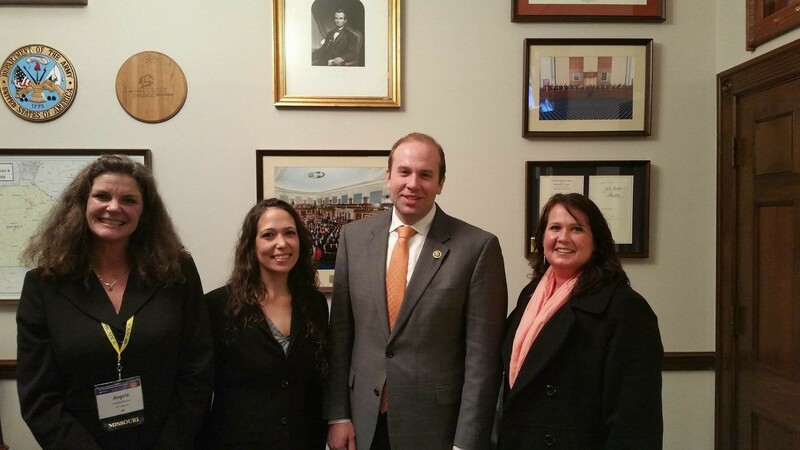 Members of SEMO University RSC, Family Counseling Center, and ACT Missouri met with Congressman Jason Smith. Getting to know you…getting to know all about you. These Julie Andrews lyrics are familiar to some of us classic folks, but who knew they applied to something like advocacy? Last week, about 30 Missourians had the privilege of attending the annual CADCA Forum, and, more importantly, had the opportunity to get to know some of our federal legislators. As exhilarating as this experience was, one does not have to go to this extreme to start the advocacy process. So, where do you begin? Do you know who your representative and senator are, but not much else? You are not alone! The best place and time to start getting to know him or her is here, and now. With a little research, patience, and diligence, you will soon know more about your legislator than just their political affiliation! If you do not know who your legislators are, you will need to determine your 9-digit zip code by typing in your home address. Once you have this, you are ready to navigate to the House of Representatives website. Type in your zip code where it says “Who Is Your Representative?” and it will take you directly to his or her page. Now you can determine: how long they have been in office, what bills they sponsor or have sponsored in the past, and what they may be willing to sponsor. You can also read their bio to ascertain what their personal interests are, what civic organizations they belong to, what their professional background is, and if they are from a rural or urban community. Use this same process with your Senator and click where it says “Legislator Lookup”. Now, to get a little more acclimated with their policy interests, investigate which committees they serve on. For example, a farmer may serve on the Agriculture committee, a teacher on the Elementary and Secondary Education committee. Make a special note of which Appropriations committee they serve on to further determine basic interests. If you want to see how your legislator voted on past bills, email ACT Missouri at info@actmissouri.org and we will research it for you. For information on lobbyists that are financially contributing to your legislator, check the reports on the Missouri Ethics Commission website. Remember, legislators rely on their constituents for input, stories, data, and most importantly, votes! Email your legislator, set up an appointment if you desire, or just offer to be a resource on your area of expertise. You will be singing “Getting to Know You…” in no time!